In Beatrice Prior's dystopian Chicago, society is divided into five factions, each dedicated to the cultivation of a particular virtue—Candor (the honest), Abnegation (the selfless), Dauntless (the brave), Amity (the peaceful), and Erudite (the intelligent). On an appointed day of every year, all sixteen-year-olds must select the faction to which they will devote the rest of their lives. For Beatrice, the decision is between staying with her family and being who she really is—she can't have both. So she makes a choice that surprises everyone, including herself. During the highly competitive initiation that follows, Beatrice renames herself Tris and struggles to determine who her friends really are—and where, exactly, a romance with a sometimes fascinating, sometimes infuriating boy fits into the life she's chosen. But Tris also has a secret, one she's kept hidden from everyone because she's been warned it can mean death. And as she discovers a growing conflict that threatens to unravel her seemingly perfect society, she also learns that her secret might help her save those she loves… or it might destroy her. This was another book I found out about thanks to Grace over at Feeding My Book Addiction. I remember liking the premise and Grace's review, so I added it to my ever-growing To-Read list over at Goodreads and forgot about it for a little while. Then it started calling to me. Every time I perused Grace's reviews or my To-Read list, I would see it. Finally, I could stand it no longer and I downloaded it to my Kindle and dug in the same night I finished reading Bird by Bird. Had I not been completely enthralled by vacation planning yesterday, I might have finished it a day sooner. Note: The following review contains some spoilers. When children in this society turn sixteen years of age, they are given an Aptitude Test. This test tells them in which faction they most likely belong. They then participate in a Choosing Ceremony, in which they choose for themselves whether to return to the faction they were raised in or a different one. If they choose a different one, they essentially turn their backs on their families and the community they've known all their lives, and are often seen as traitors. We meet Beatrice "Tris" Prior the day before she and her brother, Caleb, will be taking their Aptitude Tests and then undergo the Choosing Ceremony. We learn that she feels she does not belong in Abnegation, that she feels she is selfish, that she is not content to sit quietly at the dinner table while her parents are talking, that she is inappropriately curious in the faction she's grown up in. When her brother unexpectedly decides to transfer from Abnegation to Erudite, Beatrice feels enormous pressure to conform, to want to be in Abnegation for her parent's sake. The choice she makes will send her on a journey filled with adventure, friendship, betrayal, and even romance as she struggles to come to terms with the person she is. Everything about this book is phenomenal: The characters, the plot, the pacing. I felt grabbed by the shoulders and dragged along as the novel took off at breakneck speed, leaving me to catch my breath when I finished. The plot in this novel is so tightly knit it could hold water. The tension, the suspense, the just-beneath-the-surface romance, are all electrifying, like holding a ball of lightning in the palm of my hand. 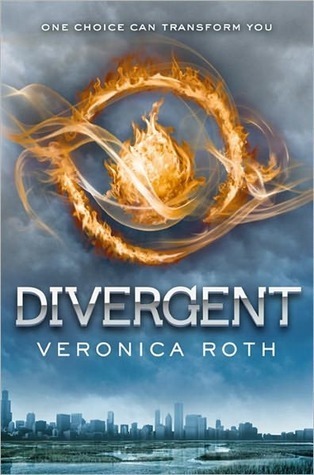 Divergent is Veronica Roth's debut novel, and Insurgent, book two of the Divergent trilogy will released May 1, 2012. I can't wait. Based on Divergent, I think we can expect great things from Roth's writing in the years to come.